We love WordPress. It’s enabled us to build beautiful websites, assemble a stellar team, and create a wonderful community around us. We are so grateful for everything that we’ve been able to achieve that we wanted to give back to the WordPress community. Through meticulous effort, we’ve re-coded – QuickStart – a free Gabfire theme to fit WordPress.org standards so that it can be shared openly on the WordPress theme directory! You can download the theme absolutely free from the WordPress theme repository. If you’d like to see the theme in action, you can view it on our theme demo page. You can install the theme directly using the theme search function within your WP Admin. No more manually downloading and uploading the theme! All updates will be delivered directly to you from your Admin dashboard similar to plugin updates. We’ve updated the code for reliability, but kept the classic design. In order for us to launch our theme on the WordPress directory, we needed our theme to fit certain requirements for WordPress.com blogs as well. We had to remove TimThumb and adjust a few other internal functions in order to meet the requirements, but our theme is still 100% Gabfire quality. We’ve added FontAwesome so you can include any of their 439 icons in your posts and text widgets. We’ve added the Big Picture Post Template that many other Gabfire themes have so you can showcase your high-res photos. 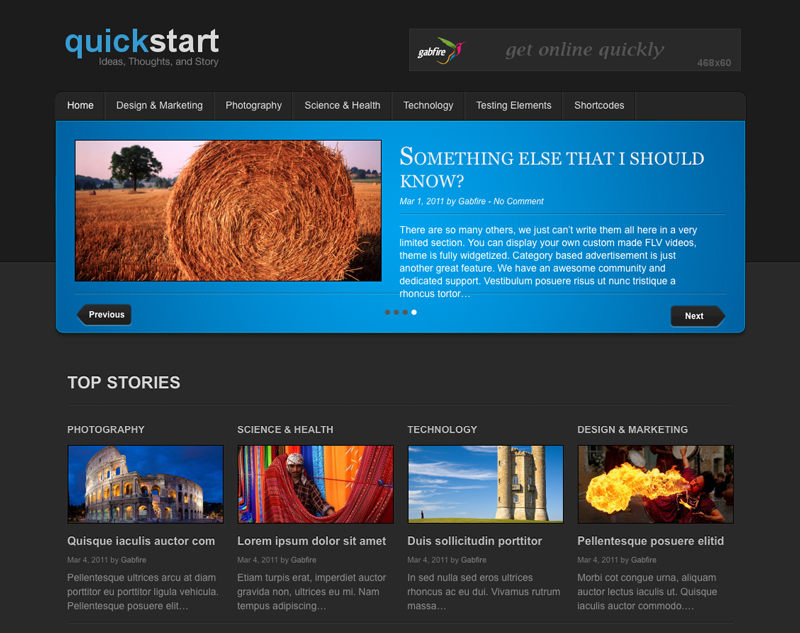 We’re hoping that those looking for a free theme to get their site off the ground consider QuickStart as the perfect theme. Any questions, just let us know in the comments or on the support forums. 2 Responses to "Quickstart Free Gabfire Theme on WordPress.org"